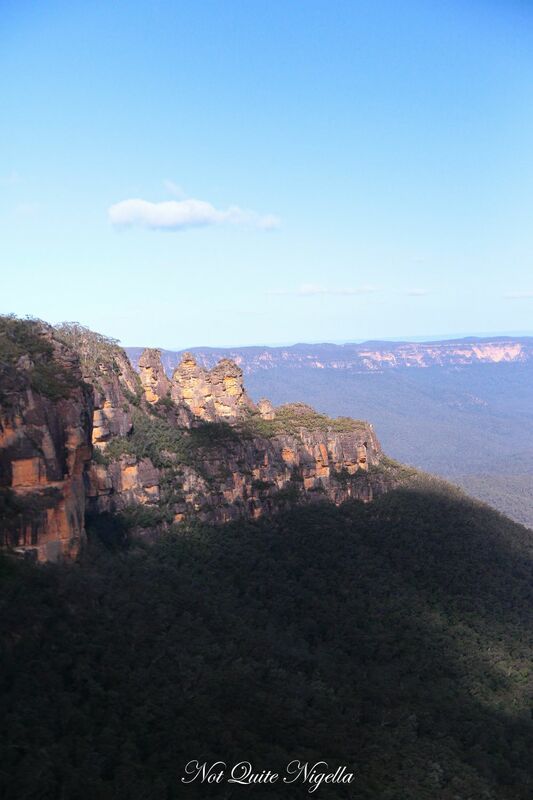 A couple of months ago, I instagrammed a picture that showed that I was in Leura. 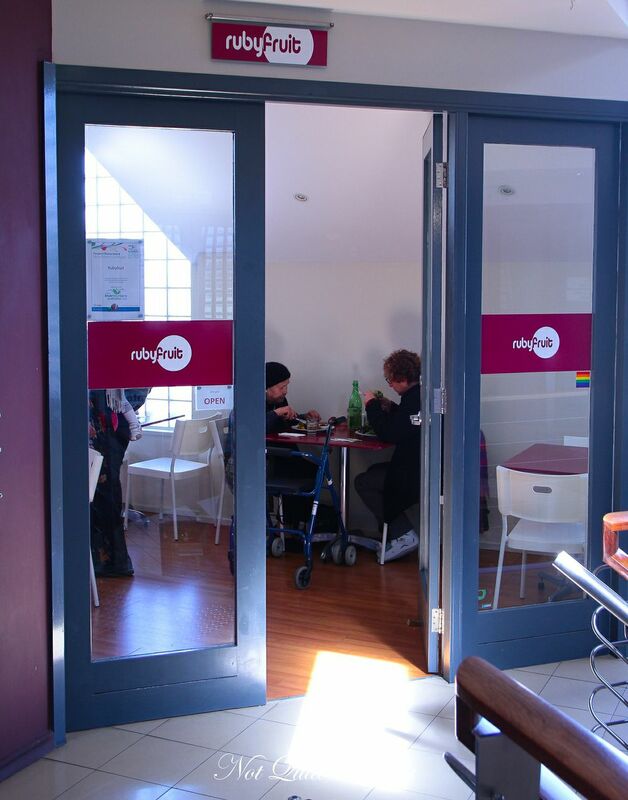 People rapidly started sending through recommendations on where to go and one place that was mentioned was Rubyfruit, a vegan cafe in Leura Mall. I was lunching with my friend from high school Lulu and her two daughters, four year old Audrey and three year old Evie who is also my god daughter and it seemed like the perfect place to catch up for lunch with health conscious Lulu. 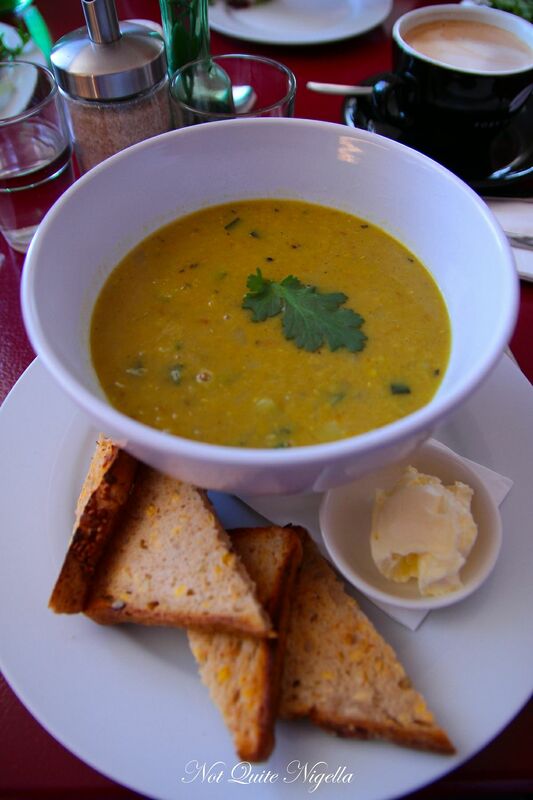 Located in Leura Mall in the Aspects of Leura arcade, it specialises in vegan food. Which is why it is so perplexing when I smell the waft of... bacon? There's a display of vegan items, many of whom I have never seen before including several varieties of vegan jerky, a soy whipped cream in a squirt canister and lots of chocolate bars, sauce and honey substitutes. 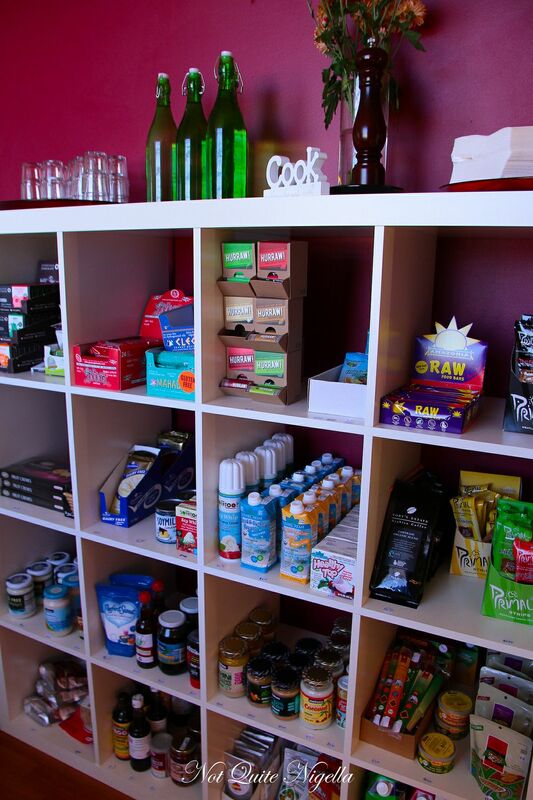 A freezer holds a range of items and pre made vegan dishes from a variety of brands. And vegans will be glad to know that the bacon is a faux bacon sold in the freezer section. We start with drinks as Lulu and the girls are already waiting for us. 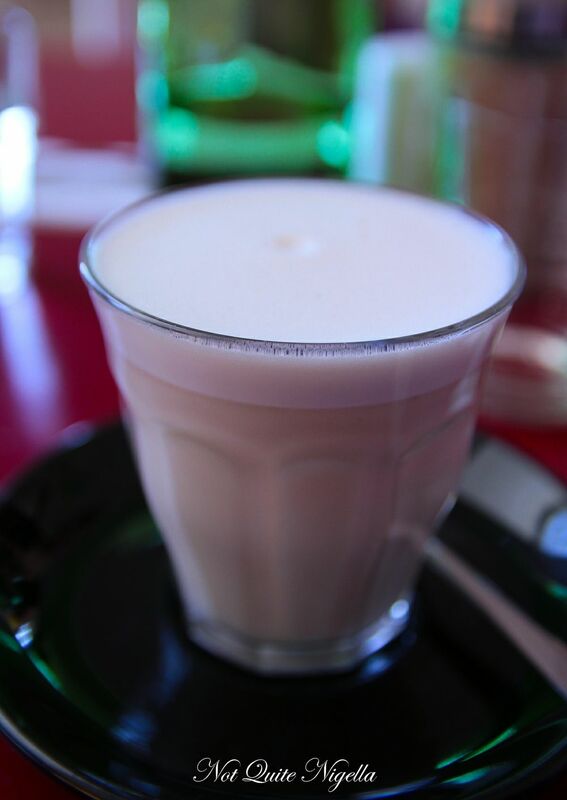 The organic ginger and cardamom chai is subtle and warming with a light chai flavour to it and a mild sweetness. 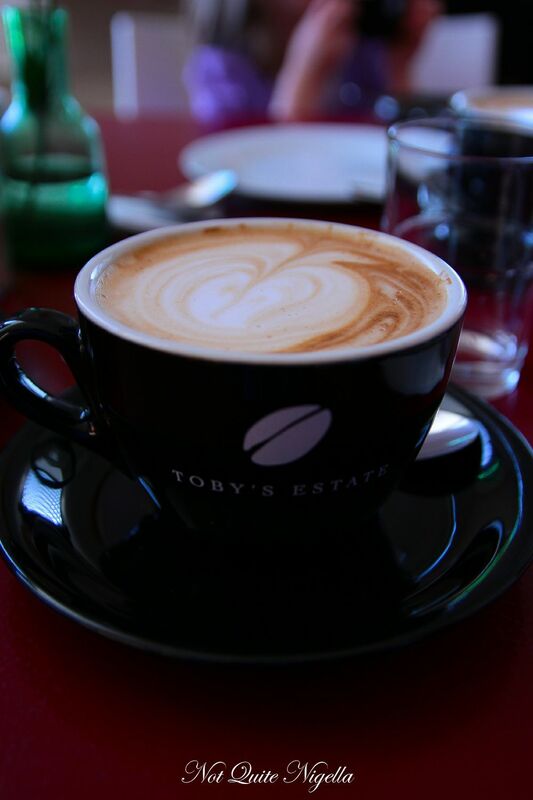 We tried the Toby's Estate coffee with the hazelnut milk which was fantastic and I must admit I much prefer it to soy milk as it lends a bit of sweetness and a good nuttiness to the coffee that soy doesn't. 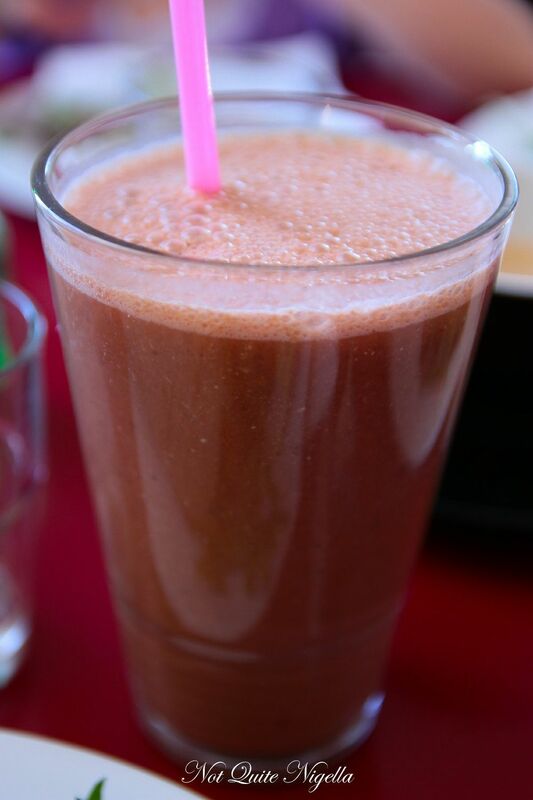 Strong with fresh banana and cacao, the cheeky monkey was a chocolate milkshake made with banana, raw cacao, rice milk and soaked chia seeds. 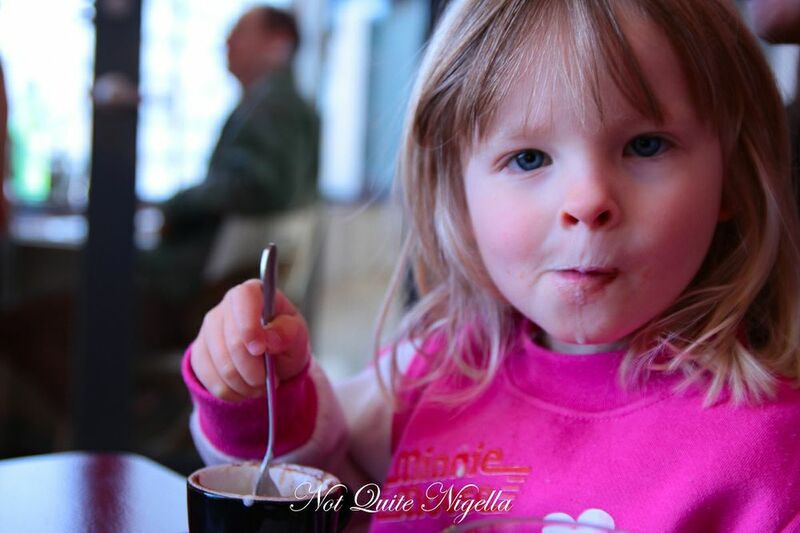 Speaking of cheeky monkeys, here's my god daughter Evie who was so intent on her baby cino that she only looked up once. Atta girl! 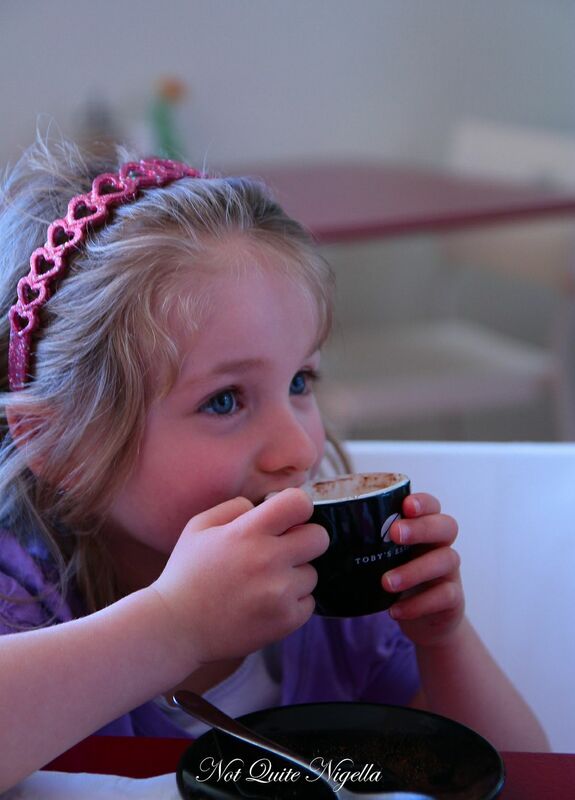 While her older sister Audrey drinks like a grown up! My choice because it was freezing outside, was the curried lentil and zucchini . It was a winter warming cavernous bowl full of thick soup, given textures from the yellow lentils and chopped zucchini and other vegetables. I ordered gluten free bread to try it out and it comes with a non dairy spread and the bread is good-crunchy toasted and slightly sweet. 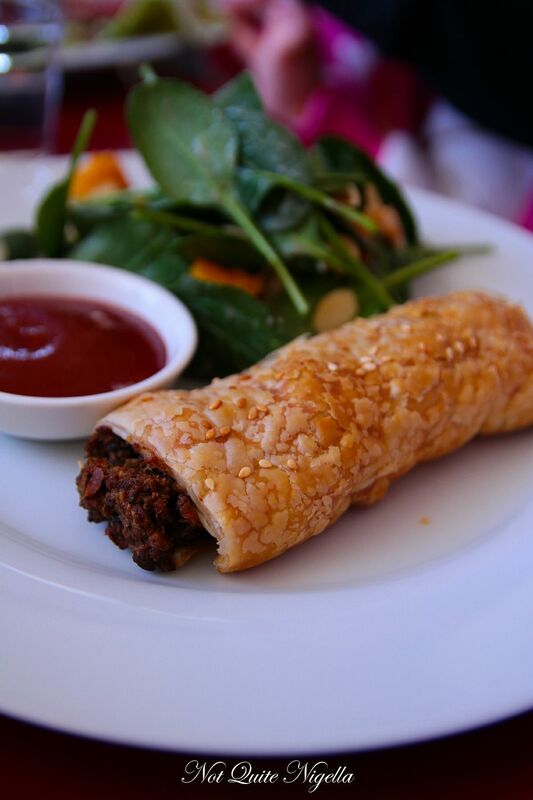 I tried some of Lulu's sausage roll which is a home made puff pastry filled with a flavoursome combination of brown lentils and mushrooms. Mr NQN's choice was a satay tofu wrap because he is crazy about satay tofu. The tofu was soft, spongey and topped with a moreish ginger satay sauce and salad in a soft wrap. 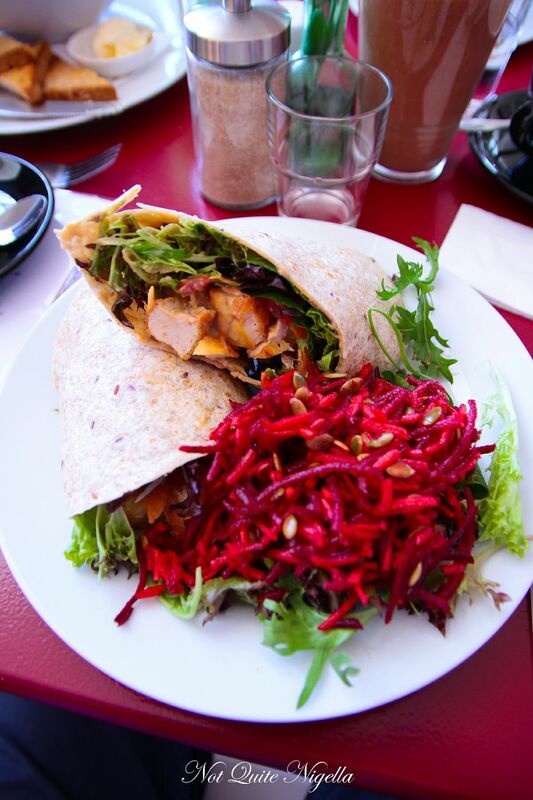 Each wrap comes with a choice of salad: rainbow, pumpkin or garden. When he was ordering I was so hoping that he'd order the rainbow salad that I blurted out "rainbow please!" to the waitress and luckily he doesn't seem to mind. The rainbow salad is a crunchy salad with shredded carrot and beetroot and roasted, salted pepitas which gave it such a fantastic crunchiness. Whilst the meals were very good, what excited me most were the cakes because I haven't got much experience making them (especially after I made a "vomit cake" which was made with rancid coconut oil). Vegan cakes can be a challenge as you can't use eggs or dairy. 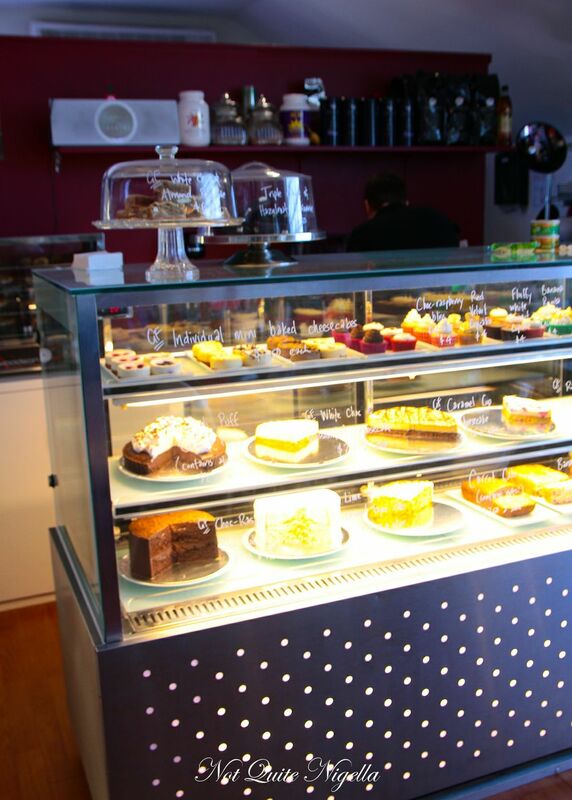 Their cake display, which transfixed the girls, shows an impressive array of cakes, including a sizeable gluten free range. All cakes are marked if they contain nuts or alcohol and what strikes me is that they all look like regular cakes. Tall tiers of cakes have fluffy white whipped "cream" and boast flavours like coconut and lime and even a bannoffee. Yep bannoffee and you can bet that I ordered a slice. One bite in and I've already forgotten that this was vegan. 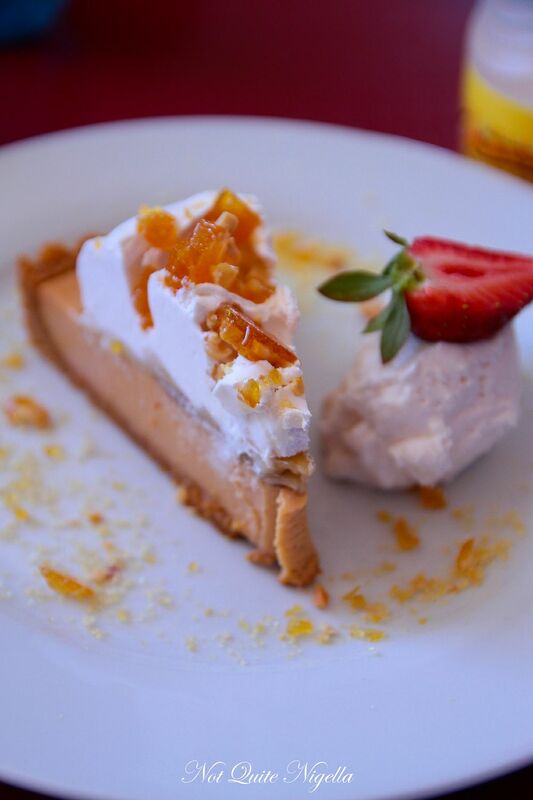 It's more like a bannoffee cheesecake than a thick caramel filled bannoffee but it is incredibly good with a delicious coconutty base, caramel filling and sliced banana. On top of this is nut cream and a macadamia nut brittle. They tell us that it is one of their best sellers with one customer driving all the way from Castle Hill to buy whatever remaining they had of it -and he wasn't even vegan! 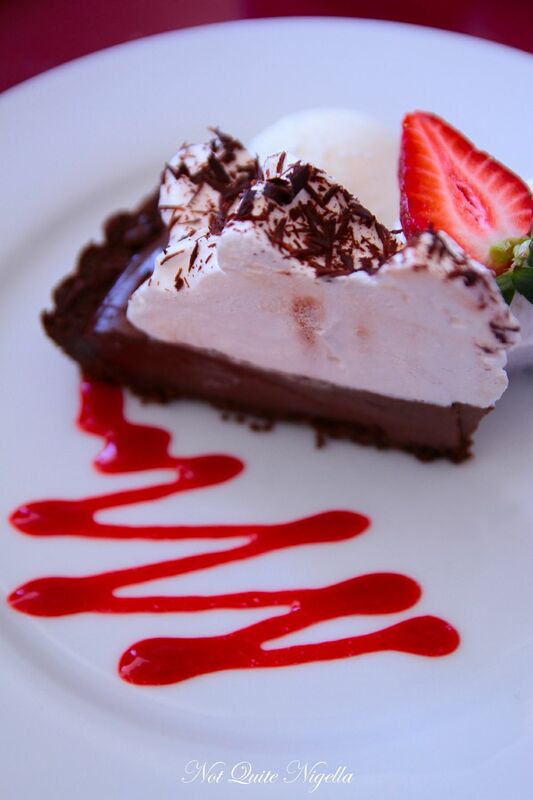 The didi puff cream pie is a chocolate ganache type of cake with a rich, dark chocolate filling, chocolate crust and a thick fluffy layer of whipped soy cream. 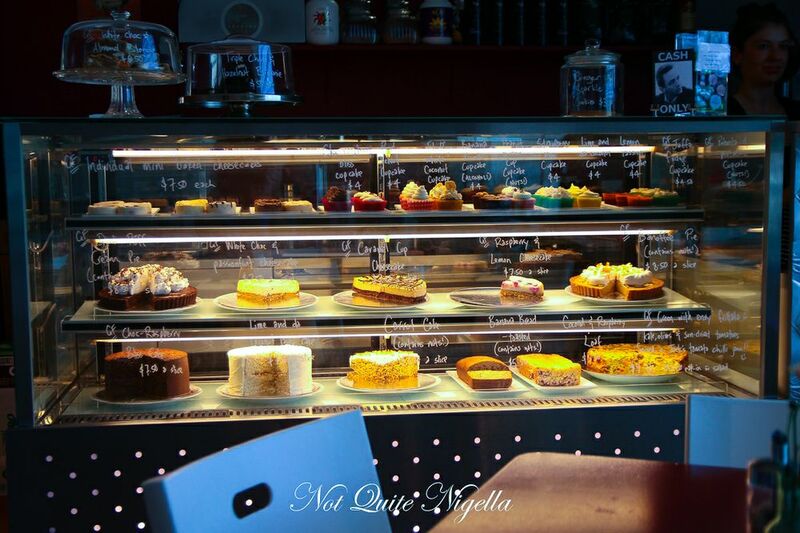 With your cakes, you can have a choice of soy cream, nut cream or soy ice cream. We opted to try a bit of each of them and the soy cream wasn't bad although I really preferred the nut cream. The soy ice cream also wasn't bad although it does have that distinctive soy taste to it. We head off to Scenic World, a place where I haven't been since I was in high school (it seems everyone has had a compulsory school trip there). I was interested to see what it was like now that they've invested $30 million in upgrading it. Originally a coal mine in 1878, it's a privately owned company owned by the Hammond family and since 1945, it has been a tourist attraction seeing 25 million visitors. Hikers or walkers used to pay the coal miners to take them back up in their coal carts and now the railway and the cable car provide alternative transport. Guides can also be booked for large or private groups and our guide Cameron takes us on the Skyline first which (thankfully) feels much safer than it used to. The middle portion of the skyline actually becomes clear so if you stand over it, you can see straight down into the 350 million year old Jamison Valley. 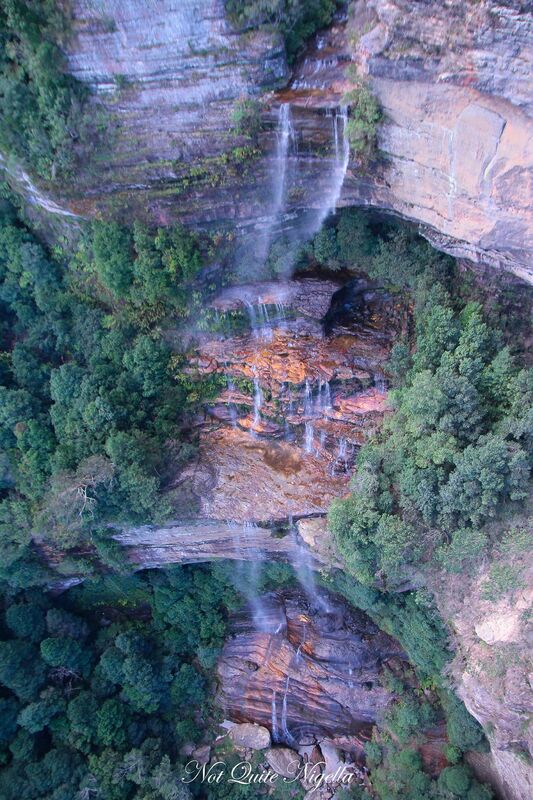 You also have a clear view of The Three Sisters and Mount Solitary, the flat topped mountain to the right and looking down you can see Katoomba Falls which is always running. 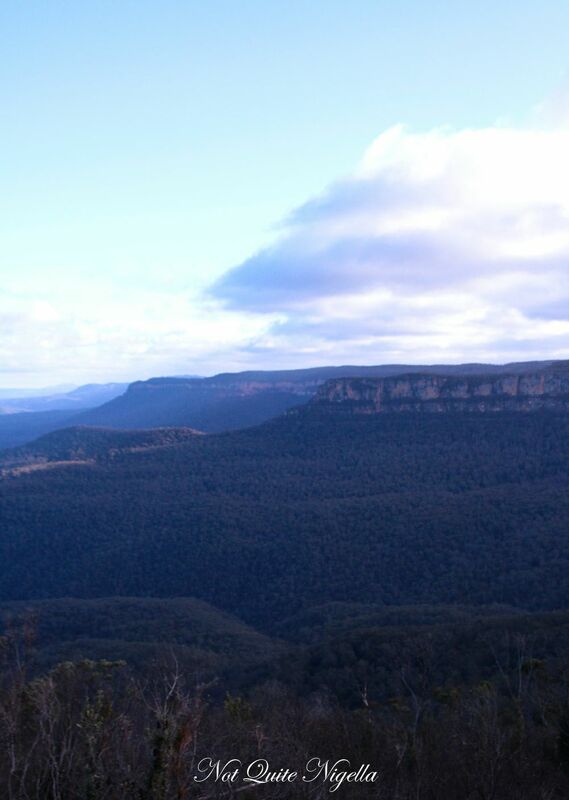 And did you know why the Blue Mountains are given that name? Because of the distinctive blue haze. This is caused by the eucalyptus oil in the trees mixing with the dust causing a hued rainbow effect. 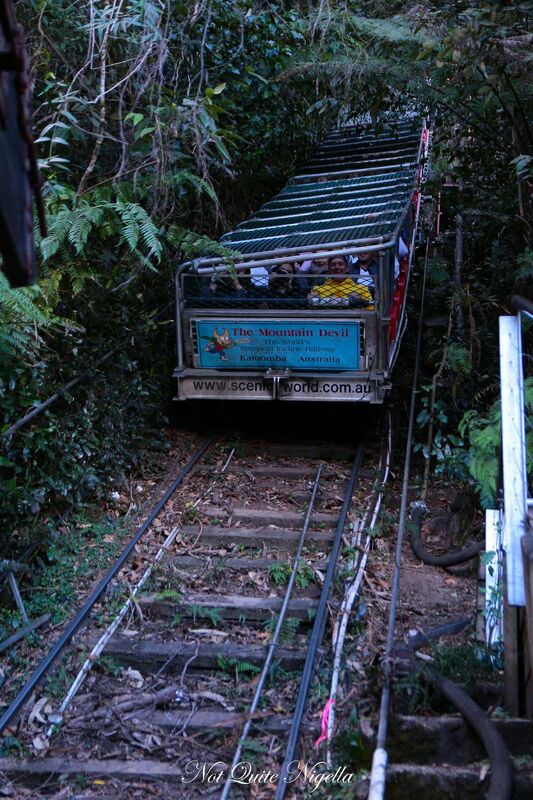 The Scenic Railway is the most popular attraction at Scenic World and is the steepest furnicular railway in the world at 52 degrees. Currently in the midst of being refurbished they are hoping that it will be fully completed by December 2012. They also take a photo of guests before they go down and these can be purchased at the main store at the end (and it is actually one of the favourite photos taken of us-straight to the pool room!). Going down is very steep and you feel like you need to hold on to avoid falling down. 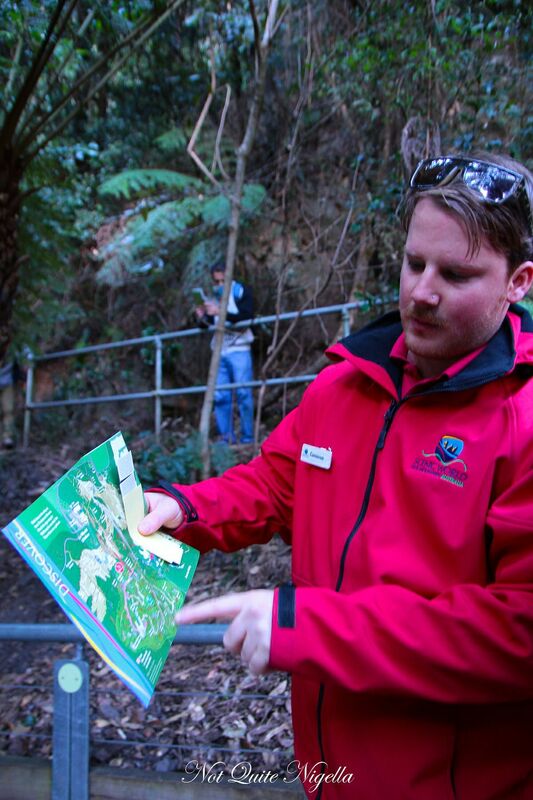 You can alight here for one of several bush walks, some are easy as they are paved with boardwalks. 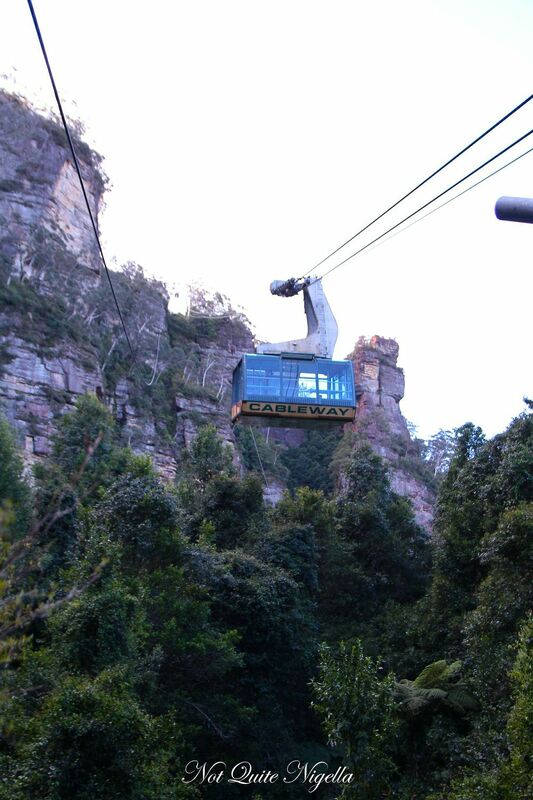 Going back up on the cableway, you might also see the remnants of the Orphan rocker, the roller coaster that was used by the Hammond family but never became a public attraction. As we reach the top, we also see Orphan Rock named so because it is a single solitary rock. 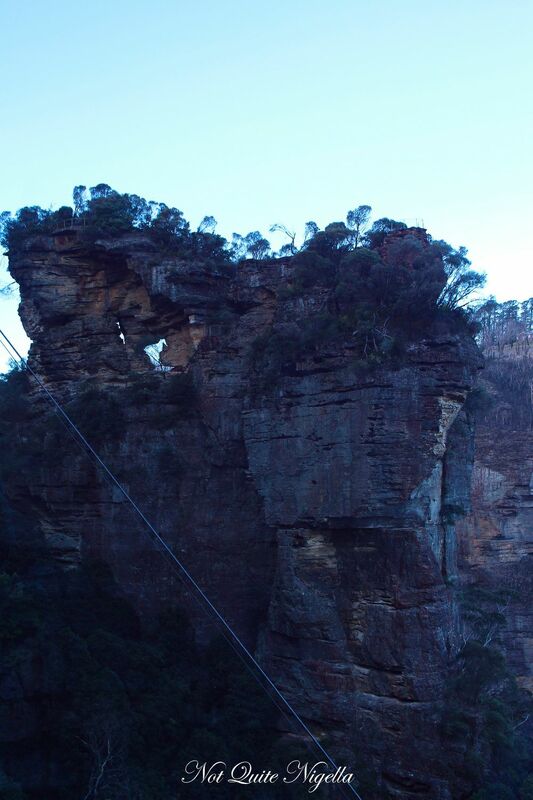 People used to be able to climb it but since two holes appeared in the rock, they've closed the walking tracks there. 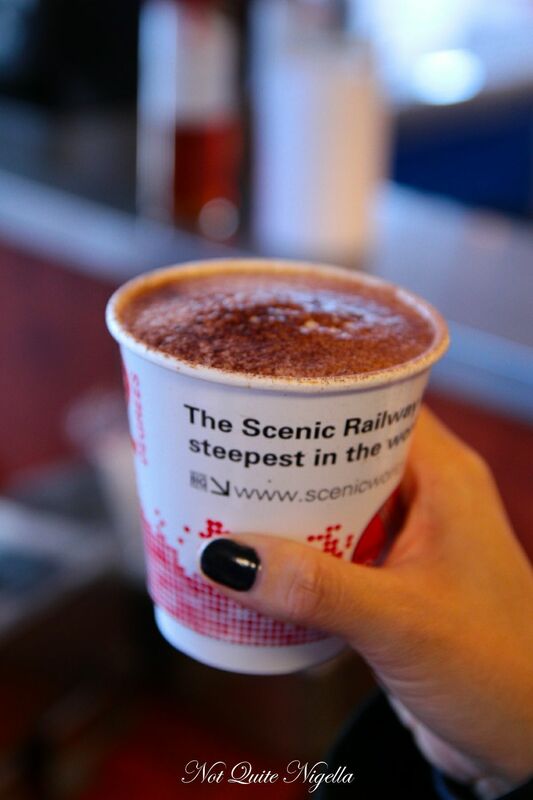 We alight, have a sample of local honey by Malfroy's gold and nougat, collect our photo and finish the chilly day with a much welcomed hot chocolate. So tell me Dear Reader, do you enjoy hiking or walks? And do you prefer to see an area with a guide or do you like to wander around yourself?